The leading pony of a pack train usually had a distinctive bell attached to a collar to warn other trains to wait in passing places, and to advertise their coming to customers because they had goods to sell or trade. It is said that it was a fine sight to see many pack trains converging through the day on a fair such as Brough Hill. Each pack train was made up of ponies who knew the route and worked nose to tail along it. Depending on the weight of traffic, there were either narrow "trods" or wider roads known as "Leadgates", "Rushways" and "Saltways". The collar illustrated here survived. It is kept at Kendal Museum and consists of a leather body carrying the main bell, which rings out clearly, and four big "rumble" bells with a loose piece of metal inside which make a continuous "chuckle" as the pony moves. The mural is in the Fell Pony Museum and was painted in 1983. Conditions remained poor until the 18th Century when a further expansion of trade in Cumberland demanded concerted effort in road building. Packways and drove roads avoided the new turnpike routes wherever possible. The land beside the turnpikes was rapidly becoming enclosed by stone walls. The walls made it inconvenient to drove cattle, who needed space to graze and also to rest to chew the cud. By keeping off the turnpikes, the drovers could keep out of the way of faster coach and wagon traffic, avoid paying tolls, and allow their animals to graze wherever it was handy. Some of the packways coincided with the drove roads; others, like the stretch in the pictures right and below, were almost exclusively pack roads. Unfortunately, because they were handy, and free, the packways and drove roads of the late 16th C were also much used by highwaymen, who could thus get from one section to another of the richer turnpike routes without being apprehended! The Cumbrian drove-road between Scotland and the towns of North West of England was known as the "Galloway Gate" - "gate" or "gait" here being the Norse word for a way along which people, goods and animals "ga". 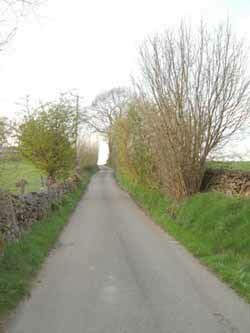 The same name is also used for a stretch of packway above Dent, near Sedbergh in the Yorkshire Dales. The Grayrigg Hause section of the Galloway Gate is still known as "The Scotch Road". The name Galloway could also easily refer to the type of ponies and cattle as much as to the destination of the road. 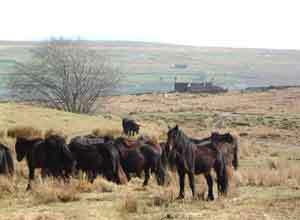 Left: Fell Ponies on the open fell between Greenholme and Shap. The line of the wall, and the ruin, mark the packway extending from the Galloway Gate and the Lune Gorge, via Roundthwaite, Greenholme, Scout Green and Salterwath, the "salters' ford"; on its way north to Shap, Clifton, Penrith, Carlisle and the Scottish Border. Packing and loading the panniers was an art. Loads had to be balanced within two or three pounds of each other or they slid sideways when the pony began to walk. A short-haul train of ten ponies could be run by one man, but for longer distances the more usual number was four ponies per man. So a ten pony train carrying a ton of lead ore would be attended by two men and a boy. At the start of the day each pony would be backed up by the "boy" to the loaded packsaddle, and then loading could start. The two men lifted the saddle and load complete onto the pony, and the boy fastened the girth, breast harness and breeching. At the evening stop, at an inn, the process was reversed and the packsaddles complete with loads were stored overnight in a building. The ponies were turned out in "closes", small fields near the alehouse. The panniers varied considerably in design depending on their purpose. Kendal Museum of Lakeland Life and Industry has another similar pair to these, again with canvas covered lids. Why have they survived better? Were they the later models, or were they perhaps less adaptable, and so put away and no longer used, while the other patterns simply wore out in a different, more varied service? This style of pannier was certainly still in use in the years before the 1914-1918 War, when the sporting artist G D Armour sketched a gamekeeper with a pony carrying such a pair. In the recent reprint of his 1937 autobiography "Bridle and Brush" the sketch bears the title "Waiting for the Bag"; in the distance are the "guns" shooting grouse. The packsaddle for this style of pannier is likely to have had had horns or cross trees which stuck up from the frame, which fitted into the holes in the back of the pannier. Garnett (1910) writes that panniers were also known as hults, holts, hots, or creels. Hult or holt probably means anything that "holds" something else, as in the Cumbrian phrase "get a holt o' this" and probably also is linked to the word "halter", something that "holds" a pony. Creels were probably open-topped. Holts could have a second, bottom door which was quickly unpinned to release the metal ore, or whatever was carried loose, into two heaps either side of the pony. Pulling out the pins to these doors had to be done simultaneously from each side so that unloading happened evenly and the packsaddle did not roll over from unbalanced weight. Garnett quotes a sale of the effects of Wm Hawkrigg, Yeoman of Underhelm, Grasmere, held in 1710, among which were an "oxe-yoak", four pack saddles, 5 pairs of holts and a peat holt. Evidently there was a difference between these two kinds of holt. Loads would be lashed fast to the commercial packsaddle in bundles or sacks. Jonty Wilson of Kirkby Lonsdale (1978) described an old packhorse saddle which he owned, built on two steel bows hinged to the wooden "tree" panels that rested on the pony's back either side of the spine. There was another hinged strip of wood lower down forming a ledge that jutted out. The hinge allowed the ledge to be pulled up pretty tight by the lashings to hold the load. The wooden frame had a canvas cover. 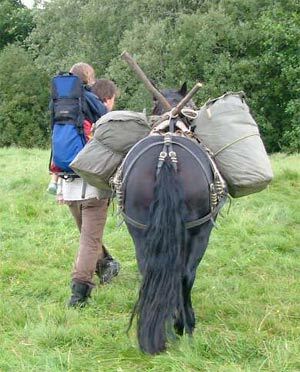 Normally there was both a breast collar and a crupper and breeching, made from 2" or 3" wide canvas webbing, to hold the load steady when going up or down hill; probably the breast collar, at least, was put onto the pony first and fastened up once the load was girthed in place. You can see handles woven into the pannier sides: one of the straps is still looped on for the breeching to be buckled in. (This means that the pannier above was the nearside one... work it out, those of you who drive ponies!) On the pack ponies page you can see how the pony wears a breast collar. Sometimes the packmen cut turf to pad the packsaddle tree and keep pressure off a sore patch on a pony's back. This rudimentary saddle seems to have been common for riding too, and to have been held in place by "hay bands" - twisted hay rope. Sometimes the packsaddle rested on a folded blanket. 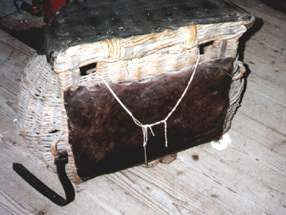 The Museum's pair of panniers has a leather pad on the back to stop the wickerwork rubbing the pony's sides. A solo attendant probably rode behind his train so that he could see any problems as they arose. When there were several men with a train, one might ride the bell horse or lead it, loaded. Descriptions of the methods vary from the ponies running loose, to being tied nose to tail; literally; the leading animal's tail being plaited into a ring to which the halter rope of the next was tied. No doubt there were many variations on this theme, depending on how much traffic the train was likely to encounter.